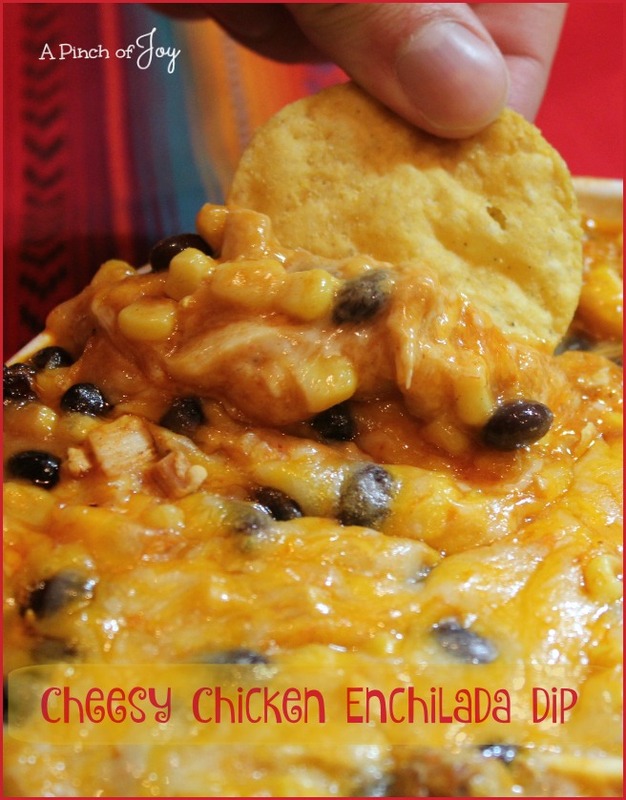 The first time I made Cheesy Chicken Enchilada Dip, I wasn’t so sure anyone would like it. They didn’t just LIKE it, they thought it was fantastic! Black beans, corn and spicy (sort of!) enchilada sauce and all. The creamy melty cheese didn’t hurt either! It is just as good the second day, too, though I had to hide a sample so I could check that out. 🙂 Sprinkle a little extra cheese on top before running it through the microwave to reheat. Rotisserie chicken works well for this, as does leftover chicken or turkey. Dice the meat on the small side for easier eating and so it won’t break the chips. I used mild enchilada sauce, but if your family likes the spicier versions go right ahead. I did add the cumin for a bit more kick so you might want to adjust that or even use a tablespoon of taco sauce powdered mix if you want more flavor boost. We like it best the way the recipe is written. Although Colby jack or Montery Jack cheese is perfectly good instead of Mexican blend. Buy your very favorite brand of tortilla chips – they help make the whole taste experience! This appetizer makes a great light and quick supper when paired with a hearty salad, too. Memorable, cheesy and flavorful, easy and quick -- disappear quickly yum! Pour enchilada sauce in mixing bowl and add cumin, black beans, corn and chicken. Mix well. Turn mixture into shallow baking dish, spreading evenly. Bake 15 minutes until cheese is bubbly and begins to brown. I’m so glad you stopped by today! Be sure to follow A Pinch of Joy using the little icons on the blue bar at the top of the page so you don’t miss a thing! I’d love to have your company on this venture!! Share: if you found this helpful or inspiring please click one of the buttons below! Your support of A Pinch of Joy is appreciated! This looks so good! I’m going to have to try it soon. Thank you for sharing! 🙂 Pinning now! 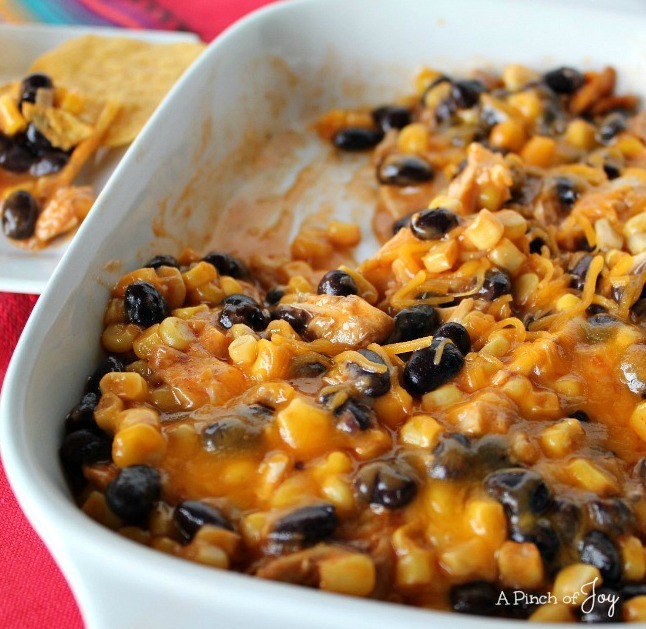 I’m always looking for new ideas for chip dip – love this one!! Would love to have you come share at the “What’s for Dinner” linky party!